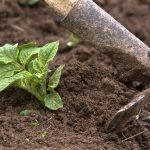 I recently planted potatoes on the side of a slopped hill, recently we got a hard and steady rain and it eroded some of our potatoes out and eroded our garden. We have tiered our hills that we planted. what do you suggest or is there a site we can get more info and pics of how we should approach this Thank-you tractorman in Dalton Ga.
Making tiers is advisable with hillside gardens. Make them so that they follow the contour of the hillside. You may also want to plant the rows pointing up and down the hill, rather than across the hill.